Traffic restrictions along Leonor K. Sullivan Boulevard. are in place during the Central Riverfront project. 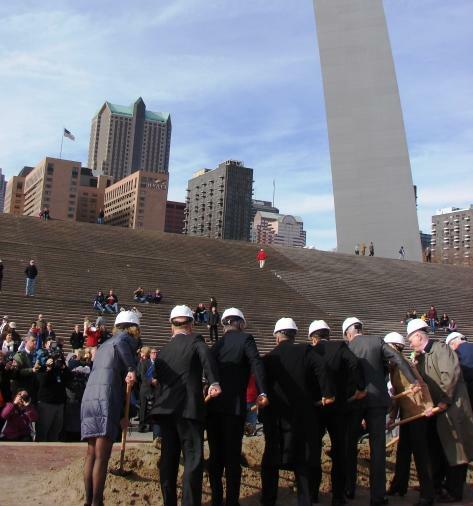 City officials and leaders of the CityArchRiver 2015 project pose for photographers during a groundbreaking ceremony Nov. 14 at the Riverfront Overlook Stage. 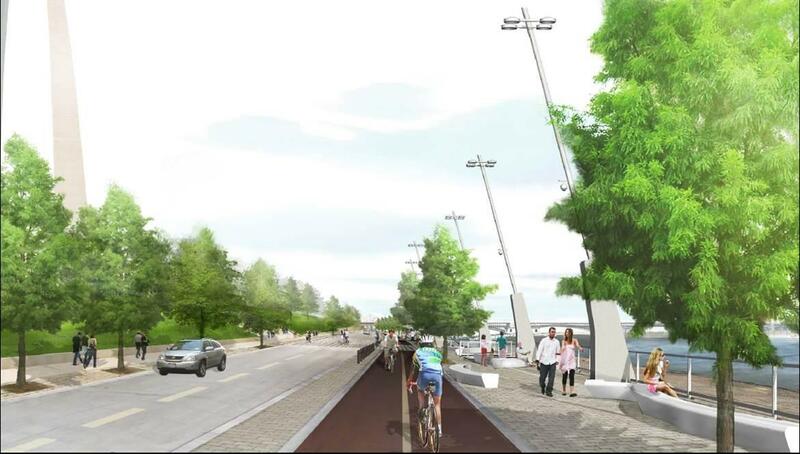 Artist depiction of Leonor K. Sullivan Boulevard when the Central Riverfront project is completed in 2015. Artist depiction of Leonor K. Sullivan Boulevard and Eads Bridge on the Mississipi Riverfront when the Central Riverfront project is completed in 2015. But many local carriage drivers, like Lammering, who make their living giving rides below the Arch are wondering what will happen to business during the two years of construction work. “Right now, myself and about 49 other drivers feel like our business is going to get hurt,”said Lammering who has been driving carriages in St. Louis for about 10 years. The riverfront component of the project involves elevating Leonor K. Sullivan Boulevard, which lies between the Arch and the Mississippi River, by roughly 2.5 feet to reduce flooding. The street is slated to be cut off during construction. 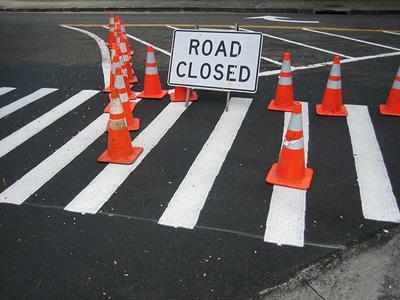 The southern stretch from the Arch staircase to Chouteau Avenue will be closed until next September at which time the northern stretch up to Biddle Street will close until the following year. Lammering said he looks forward to seeing much-needed improvements along the riverfront, but waiting in the meantime could be devastating for business. About half his fares come from Leonor K. Sullivan Boulevard, he said, which can sometimes have 15 to 20 carriages lined up at one time. Fellow driver Daemon Bernstein, who often picks up passengers six blocks north on Laclede’s Landing, adds that because the Metropolitan Taxicab Commission limits where carriages can park in the city, restrictions below the Arch could jam areas elsewhere. “You add a dozen carriages downtown when you’ve already got eight or 10 downtown, you’re going to have a lot of starving carriage drivers,” he said. A number of other small business owners near the Arch are also expecting to be affected during the redevelopment project. Tom Dunn, director of Gateway Riverboat Tours says he’s had to relocate his attendant to the north side of Leonor K. Sullivan Boulevard to help direct visitors to the levee where the company’s two boats are moored. “It will take some adjustment after 200 years,” he said referring to how long it’s been since French explorers first landed on the riverfront. Dunn says he’s less concerned, however, because developers have made efforts to ensure visitors still have access to the levee. Ryan Loeffer, who owns the bar Big Daddy’s on nearby Laclede’s Landing says he feels the drawbacks that construction will have on his business will be outweighed by the enormous number of new visitors the redevelopment will ultimately bring to the area. “If you’re used to coming downtown, it should have no effect,” he added. Likewise, said Steve Owings who owns the bar Sundecker’s also on Laclede’s Landing. CityArchRiver 2015 Communications Director Ryan McClure says last week he, Lammering and the owner of St. Louis Carriage Company sat down to address the concerns of the drivers and agreed they will work together to minimize the impact on business. McClure says while construction over the next few years may be an inconvenience in many ways, the 12-component project is designed to provide unique opportunities as well. During the work, viewing platforms are planned for visitors to survey progress and web cams will live-stream the work sites online. McClure says, in addition, the National Parks Service is connecting with area educators to incorporate the project into their science, technology, engineering and math curriculums. While the entire CityArchRiver 2015 project is running about six months behind schedule, the riverfront component of the plan is expected to be finished by the Arch’s 50th anniversary in the fall of 2015. In the meantime, carriage drivers can still be counted on for rides on the open half of Leonor K. Sullivan, six blocks north at Laclede’s Landing and on 4th St. near the Old Courthouse. If your daily commute includes heading west out of downtown St. Louis on I-70, you may need to find an alternate route. Shortly after rush hour on Monday morning, the Missouri Department of Transportation is permanently closing the ramp from Pine Street to westbound I-70. The closure paves the way for work on the Park Over the Highway, which is part of the CityArchRiver 2015 plans to revamp the Gateway Arch grounds. MoDOT spokesman Andrew Gates said the ramp will ultimately be replaced early next year. 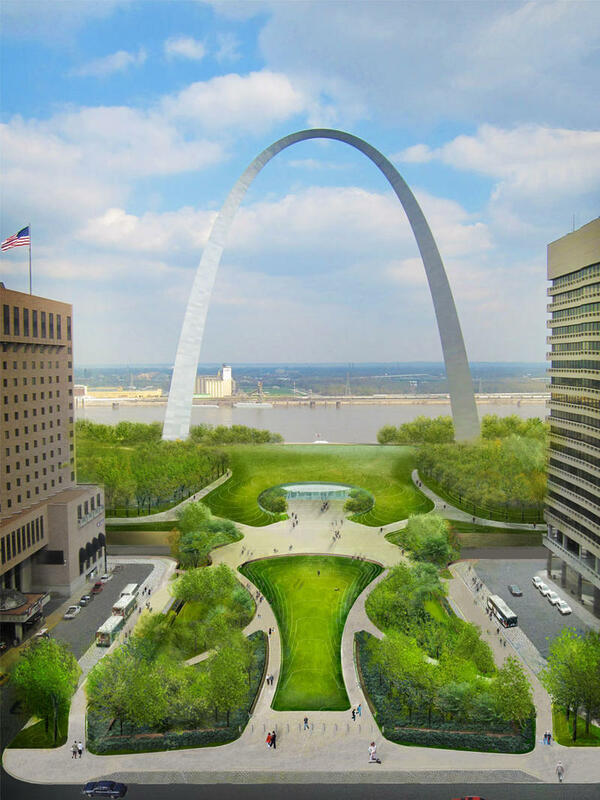 Construction of the Central River Project along the Gateway Arch begins November 14. It is a key component of the CityArchRiver 2015 redevelopment plans. Great Rivers Greenway is taking the lead on the project. 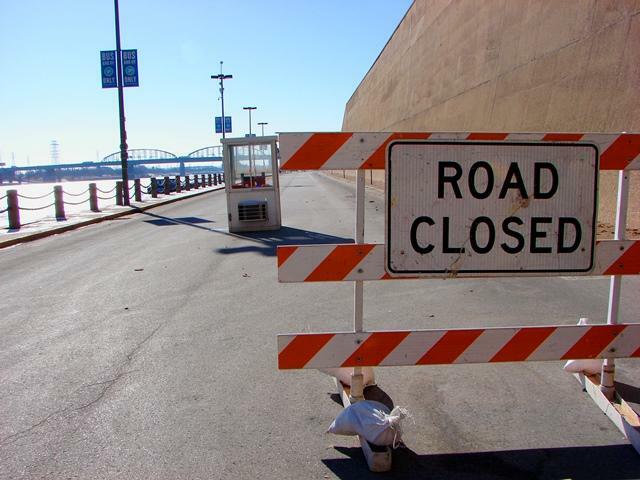 A busy area of downtown St. Louis will close for about a month starting today as part of the project to improve the area around the Gateway Arch. The Missouri Department of Transportation says Washington Avenue between Memorial Drive and Second Street will shut down after Monday morning rush hour. The closing is part of a project to create a parkway over Interstate 70 and improve access between the Arch area and the rest of downtown. The multi-million dollar project is expected to be complete in 2015.